Josh Forster, an apprentice with Nexus officially opened the all new Training Centre at Story Contracting’s Burgh Road base in Carlisle. 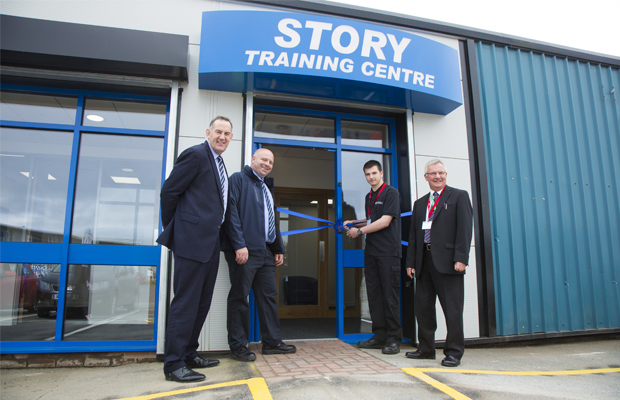 The opening was attended by Phil Kirkland Head of Maintenance for Nexus, which owns and manages the Tyne and Wear Metro, Fred Story Chief Executive of Story Contracting and Tom Wall, Training Centre Manager. The building has undergone extensive refurbishment over the last 14 weeks by Story Contracting’s Construction division to convert offices already owned by Story Contracting in need of modernisation. The Centre will run specialist courses catering for the rail, construction and plant industries from Personal Track Safety courses to Crane Controller and CITB testing. The Centre has state of the art smart boards which will make teaching more innovative and interactive. The Training Centre now has three training rooms accommodating up to 40 delegates with two further booths on the first floor, along with disabled facilities on the ground floor for CITB touch screen tests. As well as training Story Contracting teams from within, the Centre will cater for an increased number of external clients and delegates. The opening on Tuesday (14th April) coincided with a visit from Nexus and a group of their new apprentices to take part in vehicle demonstrations in Story’s yard on their specifically built test rail track. Nexus, which owns and manages the Tyne and Wear Metro, has embarked on a third consecutive year of apprentice recruitment for its rail engineering section. 6 of their apprentices got to see Story’s state of the art Road Rail Vehicles and their capabilities demonstrated through numerous scenarios on the day. “This is an excellent opportunity for our apprentices to get first-hand experience of rail maintenance vehicles in a bespoke training facility. What Story Rail has created is really top class and will be of great benefit for the whole railway industry. Story Contracting’s Training Centre will embark on a period of offering tailored learning to a number of external clients as well as being able to develop the teams across the Story Contracting business from within. The Centre has state of the art smart boards which will make teaching more innovative and interactive. The Centre now has three training rooms accommodating up to 40 delegates with two further booths on the first floor, along with disabled facilities on the ground floor for CITB touch screen tests. As well as training, Story Contracting teams from within the Centre will cater for an increased number of external clients and delegates.